Zlatá rybkaー金のさかなー: 見えないチェコ料理。　Invisible Czech dish. Recently we have a lot of things to do, so we can't write a blog. Exactly, we have apprehensiveness about an uncertain future. This is also happened on me when I go to restaurants in Czech. I can't guess what the dish comes to me like if I "see" the menus. For the time being, I guess volumes of dish to read the place about price and quantity: "-g", "-ks (how many pieces)" on menus. Accordingly them, I decide the one with name and momentum. But, I feel scare about it until it is carried in fact. I don't like raw meat, but in Czech everyone can eat them without any problems, so my uncertainties are increasing when I am waiting. 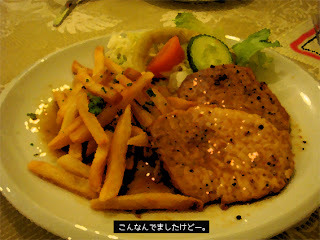 However, well, the dish is carried to me are almost nice. I can't guess before ordering, but I don't have mistakes usually. "It is easier to do something than to worry about it." First, to do something before considering various things. I think we can get nice meal unexpectedly after that. I hope our work is also like this.